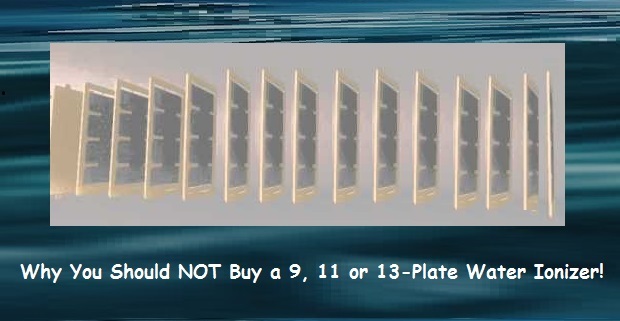 Many people automatically think that 9 or 11-plate water ionizers [or even 13] would naturally be better than 5 or 7-plate water ionizers. This is absolutely NOT the case. The perception of "bigger is better" has been proven to be untrue in electronics over and over. You have more operational power in your tiny cell-phone today than anyone had in their huge computers in the 70's and 80's. Why? Because smaller [not bigger] is better in electronics! The plates (electrodes) within the water cell of a water ionizer are the heart of its electronics. There is only so much electricity that comes into a water ionizer, and to spread it out over too many plates requires that you increase the overall watts to the device to potentially unsafe levels. In addition, when you increase the number of plates you need to decrease the watts going to each plate. Further, by the laws of electronics, if you don't increase the watts proportionally to the increase in mass of the electrodes, then your ionization will actually drop off. With 11-plate water ionizers, for instance, not only is safety an issue, but with all of the water ionizer testing I've done, I have personally proven that 11-plate water ionizers are absolutely not better at all. My tests have shown in fact that the results of an 11-plate water ionizer was worse than a 5-plate water ionizer. With 11-plate water ionizers you have to speed up the water-flow a bit, in order to keep the plates from over-heating, and in doing so you lose some of your ORP [antioxidant-water] strength. A better solution, if you need a very fast water flow would be to buy two water ionizers. You would get better and safer ionization that way. The 9, 11, or 13-plate water ionizers will not give you better ionization. 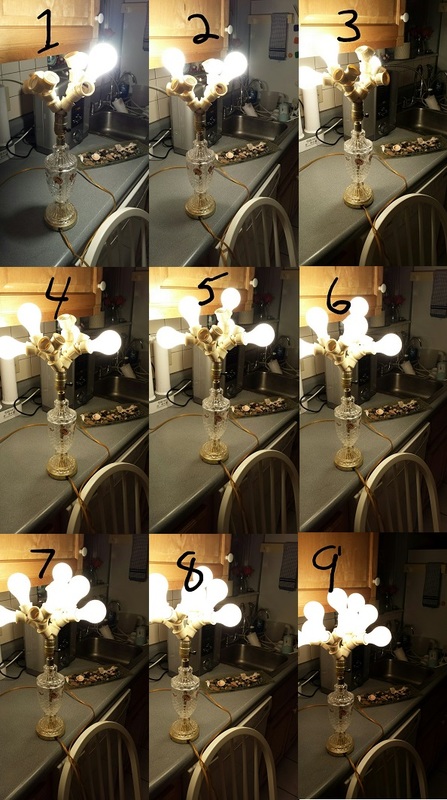 Take a perfectly good lamp and put a 100-watt bulb in it. All's good. Then add another 100-watt bulb. That's fine too. But now let's get ridiculous and have our lamp hold 9 bulbs. Honestly, that is not safe! Your appliance only allows 110v of current to go through it. About the maximum for safety would be about 300-watts. 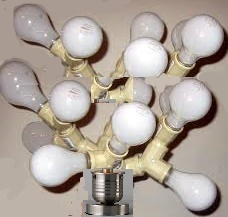 Lamps that hold more bulbs than that will tell you to use fewer watts in each bulb to accommodate for the extra bulbs rather than allow you to increase the overall watts to unsafe levels. At a certain point the effectiveness of adding more bulbs doesn't improve the lighting, and so the lit environment will seem to not change. But then the lighting even gets duller when you clearly have added too many. The heat coming from the each bulb will be pretty strong for the first three bulbs, but will then diminish as more bulbs are added until they just feel warm, not hot anymore. The companies that sell 11-plate water ionizers, such as the Tyent MMP11 and Life M11, come from water ionizer manufacturers with inexperienced engineers who are trying to look like they sell the best water ionizers simply because they put more plates in them and claim to use more watts. These are relatively newer to the ionizer development field, compared with the 35-year-old Jupiter, Enagic, and Nexus companies. It's hard to say who their development teams are, because on their websites the one thing that is ignored is the credentials of their research and development engineers. One exception is with the Vesta water ionizer. The manufacturer and designer of this system used advanced electronics principles to power the plates in very quick bursts in a controlled sequence that would excite greater ionization while at the same time continuously-clean the plates. How do You Get the Best Water Ionization from a Water Ionizer Then? On my Comparing Water Ionizers I explain the best way to get the maximum results from all electric water ionizer systems. That is to use a method of cleaning the plates that is continuous. The reason is because Platinum, directly touching the water, catalyzes [speeds-up] electrolysis. The intermittent cleaning water ionizers, such as Tyent, Life, Enagic are not able to compete with the efficiency of ionization capable with a continuous-cleaning water ionizer regardless of increased power and plates. Continuous-cleaning water ionizers clean every spec of calcium off of the plates so there is nothing whatsoever interfering with the platinum touching the water and catalyzing the electrolysis. Another technique that has worked well to increase efficiency in water ionizers, is the use of mesh plates. When properly done and combined with continuous-cleaning, mesh plates utilize the principles of efficient electronics and water ionization by decreasing the mass of the electrode while increasing the surface-area that the water touches as it passes through the water cell. Provided that the titanium used is pure and the Platinum coating the plates is pure, the structure of any plate [mesh or otherwise] will not degrade. It will last far longer than a lifetime; that's for sure, unless you corrode it with excess sodium or melt the platinum with too much power/heat. One other caution regarding mesh is if continuous-cleaning isn't used, the grooves [creating the greater surface area] could potentially become filled with calcium [scaling] and defeat the purpose of using advanced mesh-plate technology. That's why I like mesh plates only in water ionizers that have continuous-cleaning.